The village of St. Lucia is nestled between the Indian Ocean and the St. Lucia Estuary. It is the only private village that is surrounded by a Natural World Heritage Site. This unique village provides the visitor with flexibility, comfort and freedom to come and go with ease. The village has two well-stocked supermarkets, a dozen restaurants, two fuel stations, several fishing tackle shops, a hairdresser, a variety of curio shops and sellers, a popular fruit and craft market, a post office and even a library, amongst other services. For more information see adverts or contact the St. Lucia Hlanganani Tourism Association on +27 (0)35 590 1247. St. Lucia was first named in 1554 - “Rio de Areias de Ouro” (River of the sands of gold) by the survivors of the Portuguese ship Saint Benedict. 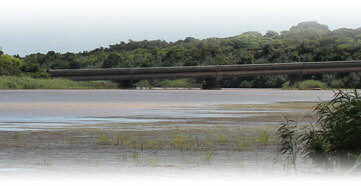 At this stage the Tugela river mouth was known as St. Lucia. Later, in 1575, the Tugela river was properly named Tugela and St. Lucia received its current name. The next naming phase took place in 1822 when a British survey expedition visited the area. Lieutenant Vidal was the captain of this ship - the H.M.S. Leven. Cape Vidal was then named, as well as Leven Point. Later Mission Rocks was named in 1888, when a Catholic Mission was established on the Eastern Shores, approximately 10km north of the St. Lucia mouth. The 19th Century saw extensive hunting for ivory, rhino horn and hippo. Fortunately, the ecological significance of the wildlife and fish resources were recognised and protected by declaring this area a Nature Reserve on 27th April 1897. This reserve included the Lake and some of the surrounding land. The original reserve of 36 826ha is considered the oldest permanently declared reserve in Africa. 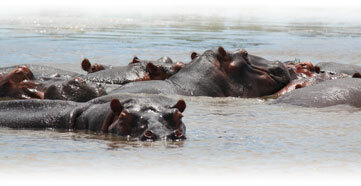 In May 2007 the new name for the Greater St Lucia Wetland Park was announced as being iSimangaliso Wetland Park. The new name, meaning "Miracle" will be effective from the 1st of November 2007. The Western Shores of Lake St. Lucia are rich in ancient marine fossils. Reports indicate that this area started forming during the Cretaceous (Chalk period), approximately 140 million years ago. There where two phases - the most recent formations were caused by dropping sea levels starting a mere two million years ago to create the largest estuarine lake in the World. The present eco-system has been sculptured through a series of wet and dry periods, rising and falling sea levels, river erosion and wind. Other meteorological events that maintain the Estuary Lake are mega-floods which flush out sediments. The most recent of these was caused by Cyclone Demoina when over 600mm of rain was recorded in a 36 hour period. To the east is the Marine System. Here the Park has 280km of Indian Ocean coastline and adjacent marine eco-system. Inland is an area known as the Eastern Shores. This area that lies east of Lake St. Lucia consists of grassy plains, wetland and ancient coastal dune forests which grow on the World famous Sand Dunes, which extend the full length of the reserve. The dunes form a natural barrier between the lake, rivers and the Indian Ocean and are covered by climax forest. Lake St. Lucia is the largest Estuarine system in the world. This extensive 85km lake is an average depth of 1 metre and home to thousands of crocodiles, hippo, birds, fish and other life forms. 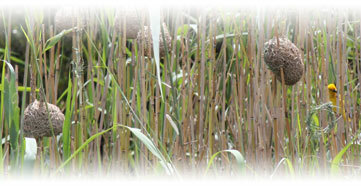 Situated on the northern end of Lake St. Lucia are the Mkuze swamps - an expansive papyrus wetland. West of the Lake lies the driest area - the Western Shores - composed of savannah and thornveld.